ALTHOUGH SHE FLITTED THROUGH AMERICA, Ida was no ho. She, we learn (or recall, if literary), married in Montana, walked in Wyoming, babbled about Alabama, and loved no one in Ohio. What the faux Dissociative Identity Disordered Ida (Ida-Ida, etc.) was was a canny, fluid danseuse, as Emily Quant’s and Cori Kresge’s interpretations of Gertrude Stein’s eponymous 1941 protagonista telepathically communicate in body and in voice in “more is more is more or less,” recently performed by the Wendy Osserman Dance Company with composer Iva Bittová and artist Sarah Olson at the Joyce SoHo in New York. Watching “More” as an amateur would arguably be ideal, given the childlike naturalism of Osserman’s company’s fluid, mesmerizing motions (although one child, hypnotized by the hovering music, slept through on her mother’s lap, a limpid Ida-gänger no doubt sent by Stein to haunt the evening). In this way, a patron might experience Stein as entirely new, with choreographic interplay, wordplay, played music and paint play (including, ultimately, the rending of the painted sheet) coalescing with shamanistic intensity. Or one could have done one’s homework and have actually read “Ida” (doubtful; this is the age of Twitter and ADHD), and thus have experienced the added dimension of the novel’s nimble humor and ultracomplexity. Or know who Gertrude Stein was, given that today we don’t seem to remember yesterday, and that Stein, une haute bourgeoise esthète, left the physical plane in 1946, before several patrons were born. On top of this, there’s the certainty that “More” represents the kind of mind game that the intelligent and famous Bittová (Iva = Ida = Id, as Osserman infers) subliminally plays with herself before unsuspecting voyeurs (and cast) for full stakes. Suffice it to say that the material has depth and legs, and that Stein, Osserman and Bittová are ergodic, requiring mental multi-tasking of high order. For Osserman and Bittová, this means scripting, choreographing and scoring a multidisciplinary montage of theater, dance, music and art, producing an intellectual orgasmatron. It’s all lush and luscious, down to the details of costume consulting by Zuzka Kurtz and lighting by Julie Ana Dobo. Olson, the artist, opens “queen of beauty” with seemingly unpremeditated painted strokes on a backlit rolling paper sheet, evoking Stein’s artist friends Picasso (memo: add light painting in version 2.0) and Matisse, as do the dancers. The strikingly beautiful, clear voiced Quant and Kresge emerge and merge with a mirror movement that’s nicely narcissistic, interwoven and surreal, accompanied by Bittová’s entrancing violin and vocal cord vibrations. Vive l’hallucination. “More” was conceived by Bittová, the Czech chanteuse/musician/actress prodigy who plays violin, African harp, frame drum and a music-box-magical kalimba denouement. Bittová, a world treasure and suspected Lamed Vavnik now living in America, is a celebrity in Prague (where she was literally a rock star); what she must think of the intimate, if elect, audiences she draws in America (Soviet-era cultural underground scale?) should alarm the sentient. The previously unexplored regions of the brain that first fire when she convokes Romani lullabies, dervish drones, trance chants, fijiri ensembles and golem activation disturb, possess and transform the listener. It is vital that the reader who wishes to look back on life as Thoreau suggested, and conclude that he or she has lived, see Bittová perform live. “More” engages and flows from the beginning. It’s light, humorous and eccentric, with moments of mild cacophony, delighting and providing, as Stein did in her own day, unexpected pleasure. Stein’s actual, disembodied voice describes “the great one,” danced by the accommodating Milan Misko, “More”’s sole male and foil, who also dances sweeping versions of whatever avant gardists call pas de deux and pas de trois with Quant and Kresge. Balinese dance gestures (Kresge studied in Bali and Java; Osserman even more widely), yogic prana and pure juvenile naïveté enable the audience to travel in space and time into Stein’s marvelous mind, channeled by the performers, to fresh, extraverbal dimensions. This raises the question of whether dancers are or ought to be nonverbal entities. 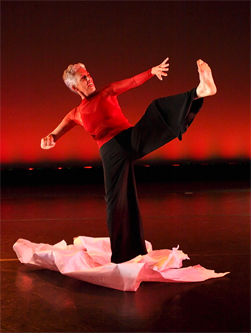 Osserman says dancers must necessarily be verbal. Indeed, in “More,” all sing or elocute; Osserman herself eloquently delivers and dances “not a lecture,” in which she explains that Stein was “alone in Paris with her English,” enabling her to explore its nuances, and to really understand it. Quant delivers arousing, accelerating chatter in “Names,” recalling Brion Gysin’s electronically mediated, Stein-inspired “I am” Machine-poem. Stein spoke of feeling language with her eyes (Ida thus a pun), which concept Marshall McLuhan would have found perceptive, but nevertheless condemned in The Medium is the Massage as the inflexible flaw of text: visual, linear thought. But Stein’s Idan ideas are hardly linear, and “More” effectively physicalizes the otherwise inexpressible abstract. The final performance was videotaped: see it, and see Iva, who will be playing in Prague, London and Poland in June, and at the Mendocino Music Festival on July 21. 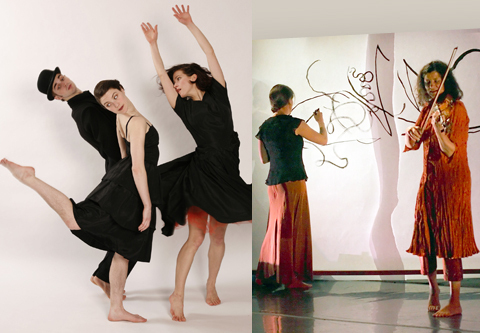 Upcoming performances by Wendy Osserman Dance Company include plans to tour with “More” in 2009, and the 29th Annual Lennon Tribute on December 4. This entry was posted on Saturday, July 11th, 2009 at 14:57	and is filed under Art, Dance, Music. You can follow any responses to this entry through the RSS 2.0 feed. You can leave a response, or trackback from your own site.